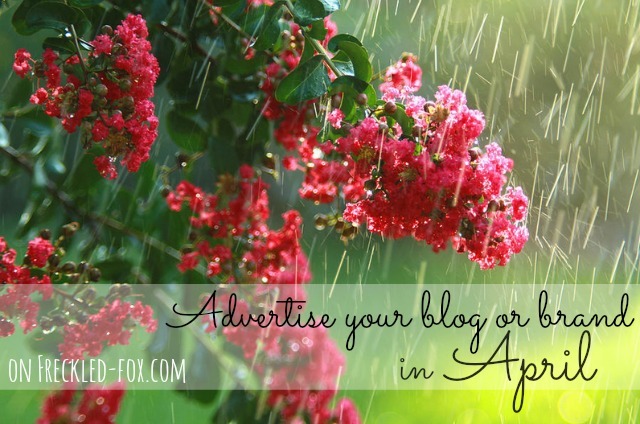 The Freckled Fox: Time for an April Sponsor Call! Time for an April Sponsor Call! Hey there beautiful people. You've probably been seeing these posts all over blog-land in the last few days, and its my turn today to officially open up the lines as it were or let you know that Freckled Fox is anticipating all the excitement and activities of April, and would love to have you along for the ride! This blog is all about inspiring and encouraging others to better their lives through fashion, cooking, styling, creating, and striving towards a more beautiful life. Think you 'll be a good fit? I'd love to have you! I receive emails daily from fabulous shops, business, and bloggers who are excited about collaborating with Freckled Fox and bringing exciting posts and giveaways to the blog in April, and I would love to share some of that traffic and promotion with you! There are many large and exciting giveaways coming, a few new series and features beginning, as well as a bunch of new spring DIYs, and tons of the old favorite recipes, outfits, hairstyles, etc. As far as openings, the XL feature spot is open for next month, but it won't last long! There is always a waiting list because this spot comes with full and constant exposure at the top all month long, as well as free feature and giveaway posts and other such perks. Freckled Fox is open to, and has supported everyone from new and small start-up companies, shops and blogs to large and well established websites and organizations, and would love to support you in whichever venture you are wishing to promote and grow. Securing your spot has never been easier then with Passionfruit handling the goods, and if you need some help with an ad button just let me know! I cannot wait to see upcoming posts on your sponsors and the giveaways!! Also, I finally posted my little letters post. yay!